/ Artist's Loft® Acrylic Paint, 4 oz. Whether you're a novice or simply haven't picked up a paintbrush in some time, get a proper introduction to painting with this quality acrylic paint. Available in a spectrum of colors at an affordable price, this paint is fast drying, water based and extremely versatile. 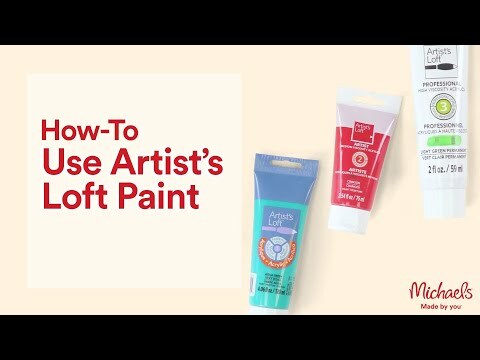 It's ideal for use with many painting techniques on a variety of surfaces, including stretched canvas, wood and metal, so grab a few of your favorite hues and shades and start creating wonderful, colorful masterpieces today. Artist's Loft® Acrylic Paint, 4 oz. is rated 4.4 out of 5 by 389. Rated 5 out of 5 by JaMaFr from Paint for Puppy Problems The paint was fine. I bought three different colors to cover up where the puppy chewed/attacked/enjoyed the furniture. Rated 2 out of 5 by Wyoming from Too thin I bought red, blue and orange to use on a canvas. The blue and red was fine after the second coat but the orange was awful. It made no difference the number of coats I used, it didn’t cover well. I now have to buy another canvas and oil paints because this was a piece of work I wanted to hang in my home but will now have to restart the entire project. Rated 1 out of 5 by Dnabgeek from Doesn't blend!! This stuff will not blend AT ALL!!! Trying to blend the paint just gave us browns and greys instead of the desired color and I know how to blend paint... we had to pull out our high end stuff for our paint night in order to get purple for people cause this paint WOULDN'T BLEND! Rated 5 out of 5 by Tammey19 from Great for paint nights with friends As student paints go they are great if on a tight budget. Rated 5 out of 5 by DebSue from Great Color Paint I liked not only the vibrancy of this particular red, but also the ease with which the paint glides smoothly over the canvas.